That’s right, our latest Quest for 100% ended this morning at an incredibly frustrating 99.8%. Now, we completed new LEGO Incredibles game, but due to a glitch in the Matrix we have been denied our 100% goal. 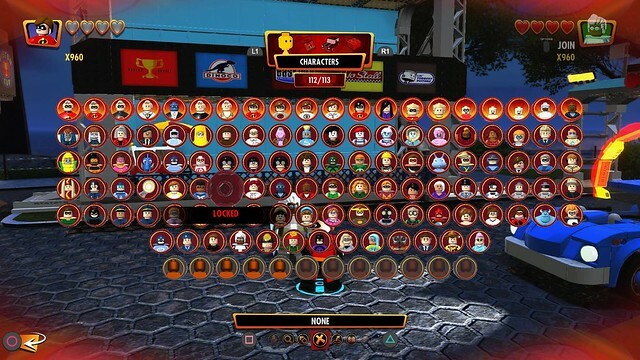 The picture below shows all of the unlocked characters earned through the playing of the game and that locked circle is the one that we were denied. Okay, so I’ll lay it all out as I give a breakdown on the game play and story progression. I’m not going to give TOO much away, but I’ll assume that anyone playing this game or thinking about it has already seen the movies. I put off playing it until now because we just got to go see it last week. The game starts with the second film, capitalizing on the synergy of it being in theatres. You’ll do levels as specific characters that makes sense for the scenes and they’ll shoehorn in extras when necessary. As you complete levels you’ll earn the usual gold bricks which now unlock minifigure packs. The minifigure packs have been standard since at least the Ninjago Movie game and I quite enjoy the animation and building up a few figures before opening them like they were real collectable minifigure packs. After completing each level, you’ll spend a bit of time in the hub and you can choose to continue the the short missions between levels or bust out and explore the hub more. Around the hub you can stop crimes, help trapped citizens, smash trash cans, build ice cream stands and all manner of other little chores. There will be about 5-10 of each and it will count off as you get closer to completing each one. The reward for catching ten purse snatchers is a gold brick and a thief minifigure. That’s the basic reward structure for the in game tasks, but there’s more to do around the hub. There are gold bricks to find hidden throughout, races which earn you more gold bricks and new “Incredibricks” which allow you to use special “family build” platforms around the hub. Once you gather a few of these bricks you can trigger a build animation and it will permanently place a fun item, like a Ferris wheel. Again, unlocking these builds gets you gold bricks and minifigures and once per level completion, a special “Pixar Family Build” platform will appear and assembling them gets you a non-Incredibles Pixar character who can help unlock a highly sought after red brick. There are 22 build platforms throughout the hub, 12 of which are Pixar builds and as you can see from the picture below, we completed all of them. There’s the problem. When we completed the second to last Pixar Family Build, we should have unlocked Lightning McQueen, but unfortunately the minifigure bag appeared for only a second and then disappeared. No Lightning, no 100%. I didn’t notice really, and kept right along grinding for everything we needed until we unlocked the last minifigure to realize we were missing one. Everything in all of our checklists said complete save the missing minifigure and bag, so we looked up who it was (easy since the game sorts characters alphabetically) and then it all became clear. We had fallen victim to another infuriating LEGO game glitch. It isn’t the only one we encountered while playing. During a boss battle the boss became stuck behind a row of his own disruptions and couldn’t get out. Luckily one of our characters could preform a ground pound that still damaged him on the other side of the barrier. During another boss battle, I was hit and somehow found myself on the outside of a cage unable to support my sidekick. I was essentially stuck in the wall, luckily my son was able to complete the battle without me. I also experienced a total game crash, but only once and that’s better than the last LEGO game we played which crashed at least a half dozen times and prompted us to set a timer and save every half hour. The knowledge that we completed the game, but are denied our feeling of victory is bad enough. On top of that, we can’t achieve a Playstation trophy for 100% completeion and so we can’t unlock all trophies. It’s like being shut out twice. Very disappointing. for both of us. The game is fun overall. We love super heroes and this wacky mix of beloved Incredibles characters along with much lesser known heroes of their world is a refreshing change from the Marvel/DC canon. There are more things to the game as well, like breaking news crime waves in the hub that will unlock more characters and are even replayable by releasing the crime bosses from the city jail. While the glitches are always a PITA , it was still a fun game. And here are a few tips on getting the most out of it. You unlock Dash pretty quick and he’s your best bet for dominating races. Leave the vehicles for fun and destruction, Dash is the race winner. Watch for Tradewind while unlocking characters. Once you have him, all the underwater and in air races are in the bag. He can seamlessly fly and dive under water. There are only a couple of Big Figs in the game, but their super jump is a ton of fun and great for destructive rampages! Go through the levels once without straying to much, but complete the Pixar build between each one. The red bricks will help a lot in the levels and hub. 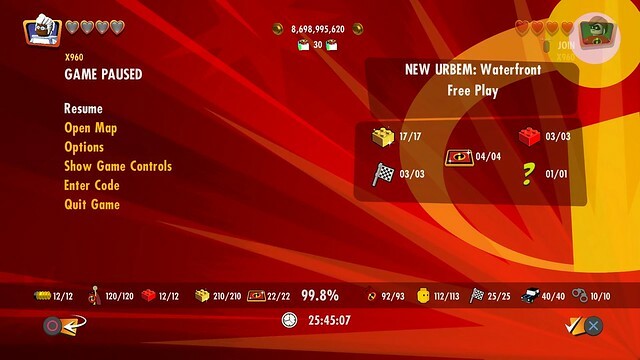 Completing crime waves opens up the map for a district and you be able to see the general location of the races, build platforms, gold and “Incredibricks”. The pick up item finder red brick will clean up almost all the rest of the unlockables. Be sure to turn on your multipliers as you still have to buy vehicles and minifigure bags, many with a 250,000 stud price tag. In conclusion: I’d wait to pick up The LEGO Incredibles until it’s a $20 bargain title unless you’re a die hard fan of the films and then you probably already have it. While not as short as games like The LEGO Movie game, it doesn’t have as much as the massive DC and Marvel games and that’s understandable based on the amount of adaptable content. Just beware of glitches and if something like what happened to us, happens to you, reboot. So save often and have fun playing! Just try not to get too hyped for another 100%.